I almost burst out laughing…couldn’t they find the real thing? Don’t worry I’ve no relationship or any link with this shop. It’s a shop selling those old “collectible” items, pricing rather reasonable. For those like me, it’s worth paying the shop a visit. Sorry, a partially hidden one above. How to play the game then? In the past, it cost about 5 cents to 20 cents for a try. You will pull a piece of paper off the Tikam board and check if you have won any prizes. Prizes depending on what is written or printed on the paper, varies from different types of cheap toys and sometimes money in terms of coins like 10 cents, 20 cents, 50 cents, etc. My family used to make these tikams at home to earn extra money. Very tedious and time consuming. We get the raw materials from tikam wholesalers. The materials came in the form of a board, one large sheet comtaining the numbers and one stack of coloured papers. The sheet of numbers must be cut into individual numbers (size is about 1cm x 1cm)and then stick onto the coloured paper by hand. After completing the tikam, my parents will send it back to the wholesaler. They do QC check by randomly picking one tikam and open it. Criteria for passing the QC check : the tikam number must not be cut off making it unreadable or the glue must not stick onto the numbers such that when it was open, the number will get torn off. Other criterias such as each rows of tikam papers must be straight and every column evenly distributed with same number of tikam papers. One of my neighbours tried making these tikam boards, all got rejected becuse the rows were all crooked and each rows are not evenly distributed, especially the last rows, either too many or too few. The wholesaler rip off all the tikam papers and make them redo all over again. Poor things, they gave up after that. We earn around $2.00 for each board we made. I have never tried playing it. My parents were very strict. They don’t allow their children to spend money foolishly on these games. Guess I did played some that failed the QC check hehe. The glue sticked onto the paper and made the winning void. 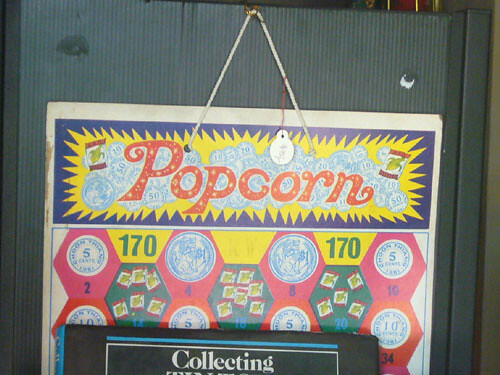 The first tikam board here, although not genuine, bears some resemblance to one that I played as a kid. 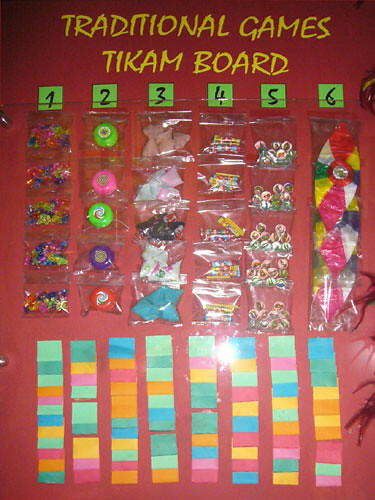 Various toys (prizes) were sealed in transparent bags, to tempt the children. The toys were stapled onto the cardboard. Besides each toy, there is a number which ranged from say 1 to about 100 (but there were gaps in the numbers which didn’t win you anything). The bottom rows of little folded-and-glued pieces of paper each contained one unique secret number, ranging from 1 to about 100. The pieces of paper were of one colour (not multi-coloured as in the photo) because they were cut from from one big piece of wrapping paper which is dark on one side and white on the other. Each piece of paper measured about 3 cm square when opened. The secret numbers were printed on a separate piece of paper of size about 1 cm square which was glued onto the centre of the white side of the bigger paper. 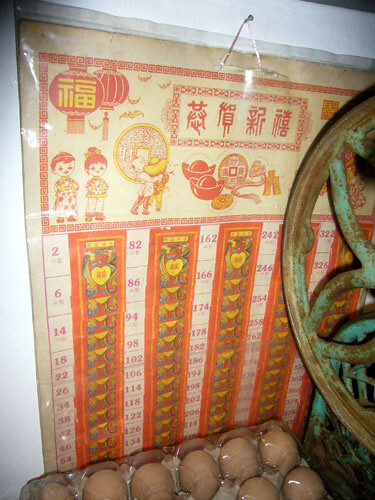 The numbers were usually printed in red ink and each number was enclosed within a red rectangular border. Tear a piece of paper containing the secret number from bottom rows. Open it to reveal the number and match it against the numbers in the top half of the paper. If there is a match, you win the prize next to the number. It’s that simple. How much does the Tikam thing sell at Grandfather’s Collections? Am interested in going to the Grandfather’s Collections shop at Kampong Glam. But which part is it located at Kampong Glam? email me at edmundquek@gmail.com thanks.. There is actually a very big space footpath and many shops there. You won’t see it from the main road. You need to go behind where all the eateries, shops and also the Kampong Glam map is located. hi, im currently working on a project to revive Tikam game in modern Singapore. 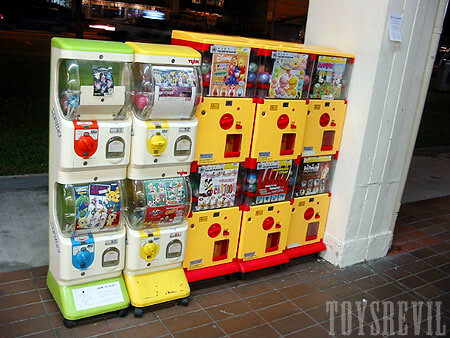 Do u all know what are the reasons for tikam( board) one to go almost extinct in Singapore? I think the main reason is you need licence to operate such gaming. i like this game in school. my school want me to make a tikam tikam board. Sorry I came across your articile about grandfather collection. I used to visit this shop when it was at Albert Hotel/Albert Court. 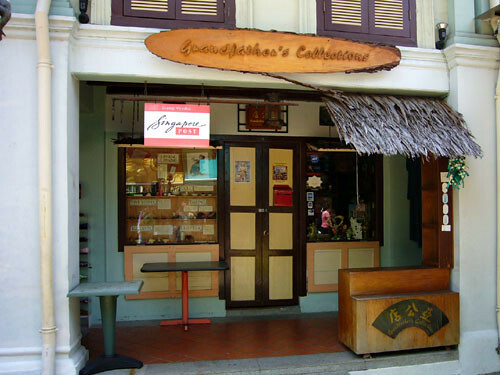 I have lost touch with the owner – a pleasant nice man who used to live i think in joo chiat area ? Send my regards to him please. You are right Peter. The owner is a nice guy. Will send him your regards if I see him again. Happy New Year to you. I am doing some research on tikam-tikam sets and hunting for families like yours that were involved in making them. Would you be able to share with me more information pls? Thanks-hoping hard to hear from you.